On September 30, 2007, a chapter in history closed. 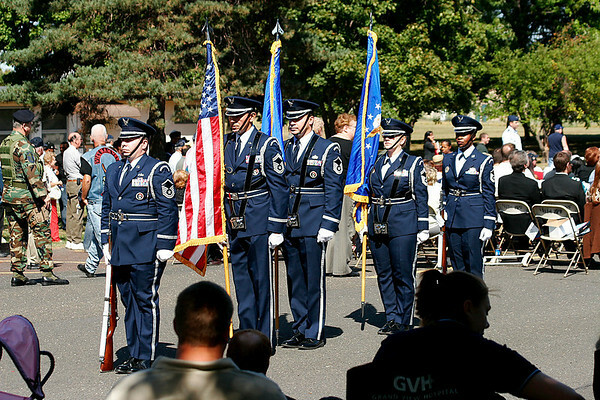 The Air Force Reserve's 913th Airlift Wing at Willow Grove Air Reserve Station, PA, was inactivated. Officials ceremoniously encased unit flags and the Wing colors, remaining wing members conducted a final retreat ceremony, and the organization was stricken from the books. This was a very emotional event for many, especially those who served for decades in this Wing and deployed together to combat zones. The bonds of friendship and camaraderie created in a military unit are strong; seeing a unit inactivated that one was once part of is emotionally very distressing. Maybe that's why I have taken so long to post these photos. I was assigned to the Wing's flying unit, the 327th Airlift Squadron, for eight years. It was my first Air Force Reserve assignment after separating from active duty in 1998. The squadron was family.....I miss them.